This article is about a previous franchise agreement. For the current railway service in operation in Scotland, see ScotRail. ScotRail was a train operating company in Scotland owned by National Express that operated the ScotRail franchise from March 1997 until October 2004. Prior to March 1997 ScotRail (British Rail) ran the trains and after October 2004 First ScotRail ran them. ScotRail operated all passenger train services in Scotland, with the exception of the Arriva Trains Northern, GNER, Virgin CrossCountry and Virgin Trains West Coast services from England. ScotRail operated services into England with services to Carlisle and Newcastle, and the Caledonian Sleeper services between Scotland and London. ScotRail inherited a fleet of Class 101, Class 117 Class 150, Class 156, Class 158, Class 303, Class 305, Class 314, Class 318 and Class 320s from British Rail as well as Mark 2 carriages and Mark 3 sleepers for use on the Caledonian Sleepers and on some other passenger services. ScotRail contracted English Welsh & Scottish to haul the Caledonian Sleeper services to London Euston. Class 90s were used south of Edinburgh and Glasgow Central with Class 37s used on the portion to Fort William and Class 47s to Aberdeen and Inverness. From June 2001, Class 67s began to take over. A dedicated pool was created due to the need to fit cast steel brakes. ScotRail ordered 55 three-carriage Class 170 Turbostars to replace locomotive hauled stock and 40 three-carriage Class 334 Junipers to replace Class 303s. In 2000, two Class 150s were transferred to Arriva Trains Northern. 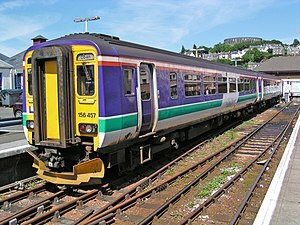 Class 158s were also transferred, four going to Arriva Trains Northern and two to Wessex Trains. The Class 101, Class 303 and Class 305s were all withdrawn. In December 2001, five Class 322s were sublet from West Anglia Great Northern, they were returned in March 2004. To replace them ex Virgin West Coast Mark 3s were leased, being hauled by EWS Class 90s on North Berwick Line services. ScotRail's fleet was maintained at Haymarket, Glasgow Shields Road and Inverness depots. In July 2003, the Scottish Executive and the Strategic Rail Authority announced Arriva, FirstGroup and National Express had been shortlisted to bid for the new franchise. In June 2004, the franchise was awarded to FirstGroup, with the services operated by ScotRail transferring to First ScotRail on 17 October 2004. ^ "Companies House extract company no 2938994". ScotRail Railways Limited. Archived from the original on 6 October 2014. ^ "Class 47". scot-rail.co.uk. Archived from the original on 19 August 2012. ^ "Class 170". scot-rail.co.uk. Archived from the original on 25 March 2012. ^ "Class 334". scot-rail.co.uk. Archived from the original on 7 April 2012. ^ "Class 150". scot-rail.co.uk. Archived from the original on 31 October 2012. ^ "Class 158". scot-rail.co.uk. Archived from the original on 6 October 2014. ^ "Class 322". scot-rail.co.uk. Archived from the original on 7 April 2012. ^ "MK3 DVT Push-Pull". scot-rail.co.uk. Archived from the original on 13 May 2013. ^ "Shortlist of ScotRail bidders puts three in the ring". Herald Scotland. 28 October 2003. Archived from the original on 18 October 2016 – via Highbeam.com. ^ "FirstGroup clinches Scottish rail franchise". The Daily Telegraph. 12 June 2004. Archived from the original on 23 June 2018. This page was last edited on 20 April 2019, at 12:37 (UTC).